Carmen Aversa Digital Artwork: Depth of Field Photos. SLR cameras are usually used to produce this effect. With a high lens aperture (small f-number) you will create a large depth of field where the foreground and the background will all, more or less be in focus. Therefore with a low lens aperture (big f-number) you will create a shallow depth of field where only your selected object will be in focus, usually in the foreground. My aim was to fake the depth of field and so I collected 2 images, the parrots and the forest background. Using the Quick Selection Tool, I selected the parrots. Before moving them onto my other image, the forest background, I feathered my selection to soften the outline of the parrots. 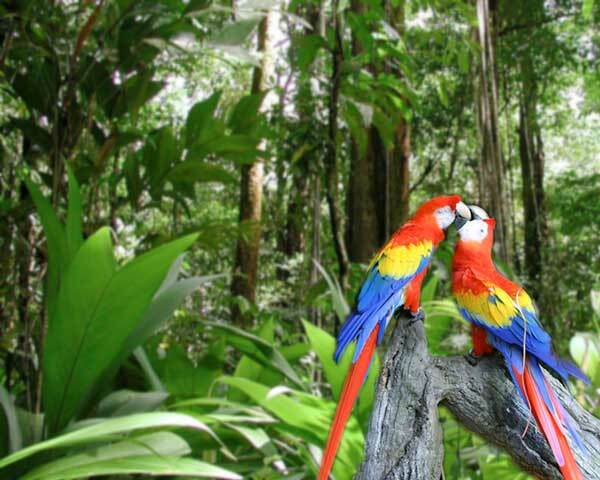 Once placed on the new background, I rescaled and position the parrots. I then saved this image. To create the shallow depth of field, I blurred my image using the Gaussian Blur to 1.5 Pixels.